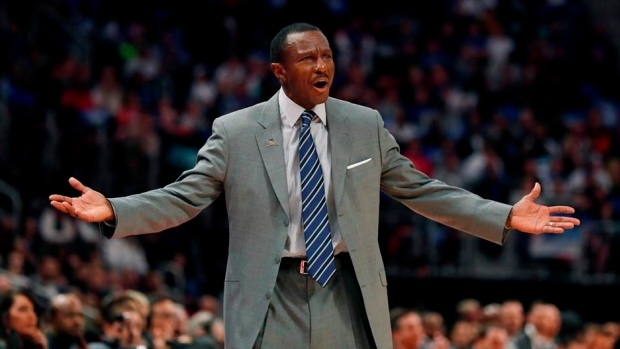 TORONTO – Dwane Casey isn’t quite sure whether he’ll be cheered or booed by the Raptors faithful when he makes his much-anticipated return to the building and city he spent seven years in on Wednesday evening, or so he says. It seems crazy to think anyone would want to boo the man after all he’s meant and will forever mean to the franchise, but Casey was around long enough to see plenty of former cornerstones return to hostile receptions. He saw Vince Carter come back and get booed. He saw Tracy McGrady get booed. Chris Bosh, Andrea Bargnani…the list goes on. Sports fans can be a fickle bunch and Raptors supporters have had a lot to gripe about over the years, especially early in Casey’s tenure. When Casey first took over as Toronto’s head coach, back in the lockout-shortened 2011-12 campaign, the team was coming off a dreadful 22-win season. They were one of the NBA’s favourite punch lines. Every star they had ever employed skipped town. The guys who stayed did so reluctantly. And so it went, until things turned. Casey was one of the biggest reasons why it turned. No, Casey will not become a member of that aforementioned, ill-fated club of booed former Raptors. Thanks in large part to his efforts, Toronto fans now have plenty to cheer about and the reception he gets on Wednesday will certainly reflect that. The Raptors will host Casey’s Detroit Pistons just over six months after firing their long-time head coach. It’s been a bizarre half-year for both parties – eventful and emotional – but here they are in the same place again, but on different paths. Toronto is off to a league-best 12-2 start with its new coach – Casey’s former assistant, Nick Nurse – and its new superstar, Kawhi Leonard. Meanwhile, Casey has landed on his feet in Detroit. He’s the first of eight ex-Raptors head coaches to part ways with the team and immediately land another head coaching gig. Casey’s return should bring back plenty of memories. Forever intertwined in basketball lore, the 61-year-old coach and his long-time franchise have been through a lot together. The winningest coach in team history, Casey led the Raptors to the playoffs in five straight years, setting franchise records for regular-season victories in four of them. He took them further than they’ve been before – the Eastern Conference Finals back in 2015-16 – and oversaw the growth and development of several players, including all-stars Kyle Lowry and DeMar DeRozan. Those accomplishments will be highlighted in a tribute video the Raptors are planning to run for Casey during the first timeout of Wednesday’s game. Even if he’s successful in keeping it cool, that should be a special moment for the basketball lifer. As you would expect from one of the classiest men in the business, Casey was diplomatic when referencing his unceremonious dismissal, which was almost unprecedented in professional sports. Coming off a franchise record 59-win regular season and first-place finish, things went south in a hurry after the Raptors were swept out of the second-round of the playoffs for the second year in a row. Casey was fired and, a month later, accepted the NBA’s Coach of the Year award as a member of a different organization. If the vibe around Wednesday’s game is a bit awkward it’s because this whole situation has been a bit awkward. The NBA is a business. We’re reminded of it regularly. Players, coaches, execs, they’ll all tell us – and probably themselves – it’s a business, but it’s also their lives. People get fired or they get traded from places they feel a strong connection to and it’s only natural to take things personally. Feelings get hurt, and that was what happened over the summer. In many ways, Oct. 17 was an important day for Casey and for the Raptors. It was Game 1, the start of the regular season, and a chance to put the past behind them and play basketball again. Suddenly, wins and losses were all that mattered, not who was talking to whom and who wasn’t. For at least one night, some of the uneasiness has returned. Questions about whether Casey and Raptors president Masai Ujiri split on amicable terms or why there seems to be tension between Casey and Nurse – former colleagues and friends – have resurfaced. It’s an inescapable narrative, but also a temporary one. Shortly after Casey’s first trip back is in the books, the Raptors will begin to prepare for Friday’s big game in Boston and their former coach will head back to Detroit with his new team. The events that led to their breakup won’t seem so important, but the legacy Casey leaves in Toronto isn’t going anywhere.